Aishwarya Rai is the wife of Tej Pratap Yadav -son of Lalu Prasad Yadav. 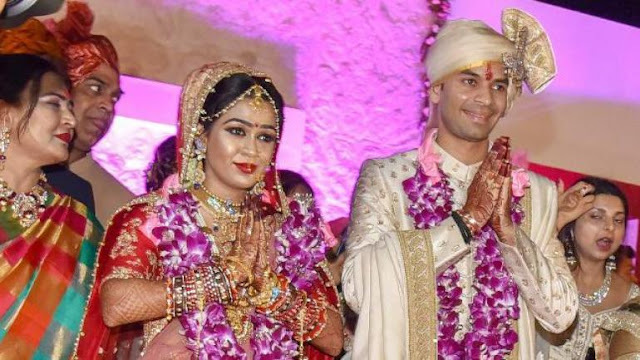 Tej Pratap Yadav files for divorce from Aishwarya Rai. Checkout more about Aishwarya Rai's wiki age husband marriage weight height details here. Aishwarya Rai was born in the year of 1993 (age 25 years) in Bajhiya, Dariyapur, Bihar, India. She was born to Chandrika Prasad Rai, is an Politician and her mother, is a homemaker. She has one brother- Apurva Rai (Lawyer) and one sister- Ayushi Rai (Engineer). Her grandfather Daroga Prasad Rai was a Politician. Her dear ones calls her Jhinsi. She is married to Tej Pratap Yadav, son of Lalu Prasad Yadav. Their engagement took place on 18th April 2018 at Hotel Maurya in Patna. And their marriage took place on 12th May 2018 at Bihar Veterinary College ground, Patna. "It is true. I have filed for divorce. I'm North Pole and she's South Pole. There have fights between me and my wife in front of my parents. I don't want to live with her anymore. Ghut ghut ke jeene se toh koi fayeda nahi hai (no point being unhappy and stressed)." Ms. Roy and her parents have already met Tej Pratap Yadav's mother Rabri Devi. Lalu Yadav, who was jailed for corruption and is currently being treated at a prison hospital in Ranchi, has asked for an urgent meeting. She is 5ft 4inches tall (165 cm) and weighs about 52 kg (114 lbs). Her figure measurements are 32-26-32. She has black eyes and hair. She belongs to Brahmin's family and holds Hindu ethnicity. She completed her early education from Notre Dame Academy, Patna. She has done MBA from Amity University, Noida. Her favourite food is Litti Chokha. She loves to travel places like- London, Paris. Her hobbies are includes Photography, Travelling, Reading. Aishwarya hails from an influential political family as her grandfather, Daroga Prasad Rai was the Chief Minister of Bihar from 16 February 1970 to 22 December 1970. And, her father, Chandrika Rai, is an RJD leader and former minister in Bihar. As she was born on a rainy day, her family gave her the nickname”Jhipsi,” as this word is used to describe light rains in Bihar. In April 2018, she hit the headlines when the news came out about her marriage to Lalu Prasad Yadav‘s younger son, Tej Pratap Yadav. In October 2018, she is in the news for Tej Pratap Yadav filing a divorce to her.